Fresh turkey with pea, rice, aronia & dandelion. Superpremium food for sedentary adult dogs, overweight dogs, and senior dogs. Holistic dog food made with 40% carefully processed fresh meat. Complete food for dogs. Fresh Turkey (40%), Pea (10%), Dried Turkey (10%), Rice (8%), Chicken fat (preserved with mixed tocopherols), Apples, Oats, Buckwheat, Psyllium, Beetroot, Salmon Oil, Brewer´s Yeast, Linseed, Chicken Liver, Collagen, Algae, Aronia (0,2%), Parsley, Rosemary, Thyme, Marigold, Dandelion (0,05%), Probiotics (Enterococcus faecium 1x109 CFU), Glucosamine 1,700 mg/kg, Chondroitin sulphate 1,300 mg/kg, Fructo-oligosaccharides 220 mg/kg, β-glucans 200 mg/kg, Mannan-oligosaccharides 180 mg/kg, Yucca 150 mg/kg, Green-lipped Mussel 100 mg/kg. crude protein 27.0%, fat content 12.0%, crude fiber 5.0%, crude ash 7.5%, moisture 10.0%, omega-3 0.7%, omega-6 0.85%, EPA (20:5 n3) 0.2%, DHA (22:6 n3) 0.4%, calcium 1.6%, phosphorus 1.1%. vitamin A (3a672a) 22,000 I.U., vitamin D3 (E671) 1,800 I.U., vitamin E (3a700) 600 mg, vitamin C (3a312) 500 mg, L-carnitine (3a910) 550 mg, choline chloride (3a890) 750 mg, biotin (3a880) 0.9 mg, vitamin B1 (3a821) 7 mg, vitamin B2 9 mg, niacinamide (3a315) 42 mg, calcium-D-panthothenate (3a841) 22 mg, vitamin B6 (3a831) 8 mg, folic acid (3a316) 1 mg, vitamin B12 0.06 mg, zinc chelate of amino acids hydrate (3b606) 120 mg, ferrous chelate of amino acids hydrate (E1) 95 mg, manganese chelate of amino acids hydrate (E5) 50 mg, potassium iodide (3b201) 0.9 mg, cupric chelate of amino acids hydrate (E4) 20 mg, organic form of selenium produced by Saccharomyces cerevisiae CNCM I-3060 (selenised yeast inactivates) (3b8.10) 0.2 mg, L-methionine (3c305) 180 mg. Contains natural antioxidants: tocopherol extracts from vegetable oil (1b306), ascorbyl palmitate (1b304) & rosemary. May be served dry or moistened with lukewarm water. Food should be divided into 1-2 equal portions during the day. The recommended daily amount is shown in the feeding table. 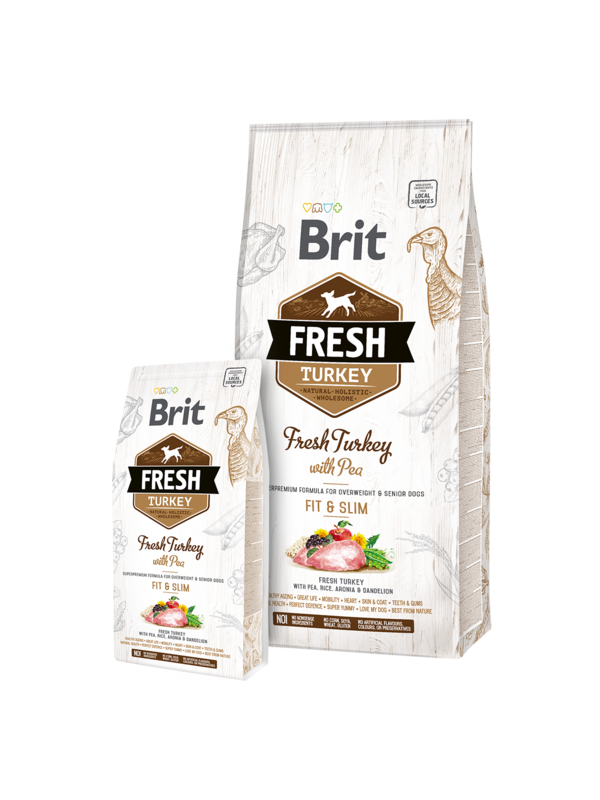 When serving Brit for first time, use smaller amounts and mix it with previous food and gradually increasing the portion of Brit. Always make sure your dog has plenty of fresh water. Best use before the date shown on the package. Keep in a dry and cool place, avoid direct sunlight. Reseal after opening.